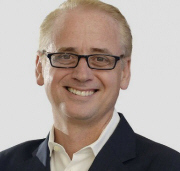 Nielsen has hired former IBM exec David Kenny as Chief Executive Officer, to replace Mitch Barns, who is retiring at the end of the year. Kenny joins on December 3rd. Nielsen's Board of Directors is currently undergoing a strategic review, led by James Attwood Executive Chairman of the Board. This includes a review of alternatives for the entire company and its businesses, and could result in Nielsen continuing to operate as a public, independent company; a separation of either Nielsen's Watch or Buy segments; or a sale of the entire company. Kenny (pictured) will join after most recently serving as IBM's SVP of Cognitive Solutions, leading the firm's AI platform and portfolio and overseeing the development of big data business IBM Watson and its cloud platform. Previously, he was Chairman and CEO of The Weather Company, joining IBM after the acquisition of the latter's Product and Technology Business. Before this he served as President of cloud service provider Akamai and as Co-Managing Partner at Publicis' digital intelligence network VivaKi. He also co-founded and served as Chairman and CEO of digital marketing agency Digitas, continuing to lead the company after overseeing its sale to Publicis Groupe. Earlier in his career, Kenny was a Partner at Bain & Company. Kenny will start with a base salary of $1.3m, an annual bonus target of $1.9m, various stock options, and $4m in compensation for leaving IBM. The latter consists of $2.5m he will receive next February, to compensate him for the loss of a cash retention award from IBM, subject to continued employment through the applicable payment date; and $1.5m to compensate him for the loss of IBM's 2018 annual incentive pay-out. Commenting on the appointment, Attwood said: 'David's decades of experience in big data, artificial intelligence, cloud technologies, and media make him perfectly suited to lead Nielsen at this critical time. Having spent a substantial portion of his career working in the advertising world, he has a deep and holistic understanding of advertisers and how best to serve them, and he has a proven track record of implementing growth strategies, overseeing strategic transactions and creating value for stakeholders. His multi-disciplinary background and history of success make him a great fit for this position'. Barns announced his retirement in July, after 22 years with the company, five spent as CEO, and the rest in senior roles including President, Global Client Service; President, Media US; President, Nielsen Greater China; and President, Consumer Panel Solutions. He began his career at Procter & Gamble. Less than three months after Barns announced his forthcoming retirement, CFO Jamere Jackson resigned to 'pursue an opportunity outside of the company', and was replaced by former Honeywell CFO David Anderson. In a statement, Nielsen's Board thanked Barns for his dedicated service and leadership.